REEL DEVELOPER is included in all of our REEL Body Art, REEL Airbrush and REEL Palette kits. 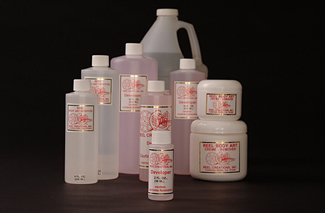 It is used for activating REEL Body Art Designs (temporary tattoo transfers), thinning REEL Body Art Inks and for small quick clean up before applying tattoo transfers or removing small temporary tattoos. REEL BODY ART REMOVER CREAM is a gentle remover for use on face, tender areas and as a general make-up remover. Removes REEL BODY ART INKS, make-up, dirt and oil from the skin while moisturizing, leaving the skin smooth and silky soft.